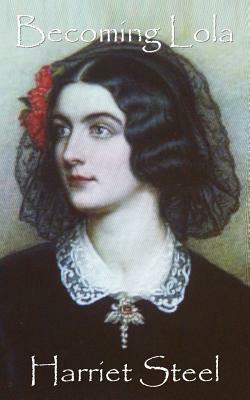 Lola Montez was a 19th-century dancer, courtesan, free spirit, and, if Harriet Steel's novelised version of her early life is to be believed, not remotely afraid to fight her corner. Her real name wasn't Lola Montez. She wasn't Spanish. She wasn't even much of a dancer, it seems. But she had a determination to live a certain kind of life and the beauty, charisma, and slapdash attitude to monogamy to make sure that was what happened. During her lifetime, she was one of the most famous women in the world, and a truly modern celebrity, in that she was famous mostly for her relationships and her fame, rather than for anything more concrete. I'm surprised Madonna hasn't made a film of her life at any stage, but I suppose Madge wouldn't like to be reminded of the fact that, unlike her, when Montez turned to acting, she turned out to be good at it. The problem with novels about real people is that real people sometimes do things without the kind of rock-solid motivation you would give a fictional person, which can sometimes make for a frustrating read. This is especially true if, like me, you're a pretty contented person by nature. The idea of being so restless, so jealous, so frustrated with the way the world works (especially as a Victorian woman), that you assault your lovers when they fail to provide for you, push people into impossible positions, compromise them and yourself in the eyes of society, and eventually end up being almost killed by a mob of disgruntled citizens because you're having a highly unpopular affair with their king, is somewhat alien to me. Maybe that's the fault of the story, but maybe it's a fault of the writing. The upshot is that I'm not sure I ever understood or got to like Montez, even though the story is told well enough that I always wanted her to succeed. I'd recommend Bruce Seymour's biography of her, Trish. It may not make you like her more, but it will give you more of an idea about her motivations. And listen to Joanna Newsom's track Have One on Me - it may not give you more insight, but it's a damned fine song! Oh, that's great. I was wondering if there was a really good biography of her anywhere. Thanks, GB.